Airsoft rifles and pistols for sale at wholesale prices. 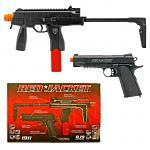 Spring, gas, and battery powered airsoft guns for every level of user. Airsoft weapons, ammo, scopes, and a variety of other products for professionals and casual users alike.